This seaside inspired Sand Dollar Table Lamp is 30.25 inches tall. It features a sand dollar and shutter panel around the lamp's base. This classic coastal lamp is a popular lighting fixture used in bedrooms, accent tables and living rooms. Light up a coastal living room with the best selling Sand Dollar Table Lamp. 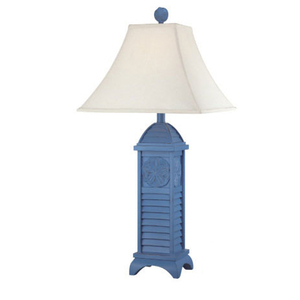 You and your guests will love the character and style of this popular coastal lamp.